LabSuit Blog: Why should one specify sub-location for inventory items? Why should one specify sub-location for inventory items? Sub-locations is a convenient way to keep account of your items. Your lab may have numerous inventory locations such as closets, liquid nitrogen racks, desiccators and so on. How do we keep track of all items inside? Tracking by one location field is just not enough! Often location has several dimensions, for example: "The bottle is located in 1) yellow closet (location field) 2) top shelf (sub-location field)"
In case of biological samples, which are stored in racks, sub-locations become crucial. The sub-location may look look that box5-4-7, which stands for box number 5, 4th row, and 7th column. Sub-location drop-down is sorted, therefore it's very easy to find the next free slot inside the box. The rack identifier may be stored in location field. Often, chemical bottles and containers are marked with A-123, A-124, A-125, when the substance begins with A. When a chemical name begins with B, it goes B-1, B-2, B-3, etc. So the marking convention is very to use! Every time you need to add new item to your inventory, LabSuit helps you to find out which sub-location was used last. Having picked the location, the sub-location drop-down list will be narrowed down to relevant location. 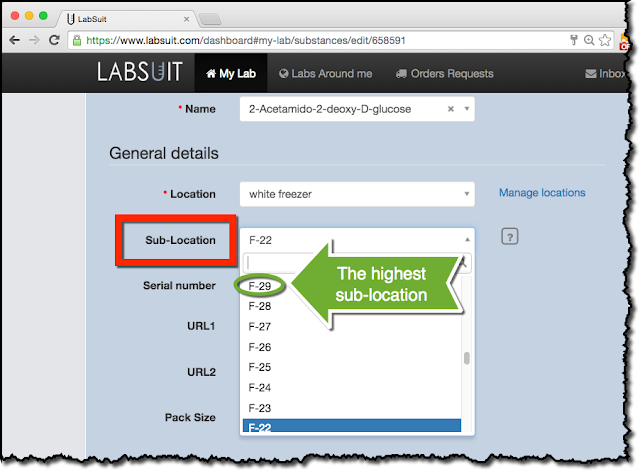 LabSuit automatically sorts existing sub-locations from Z-A, or from high to low, so you know what sub-locations are occupied and what sub-location should be inserted next.